Happy Friday! I’m so glad we finally made it to the weekend! In honor of this weekend being Halloween weekend, I thought I’d mix things up a bit and do a super different, fun post! Earlier this week I asked you guys on Instagram stories what your favorite Halloween candies were! Then, I took the top five candy suggestions and teamed up with my friend (and upstairs neighbor) Laura, who is currently studying to be a sommelier, to find a wine pairing for each of the top five suggestions! 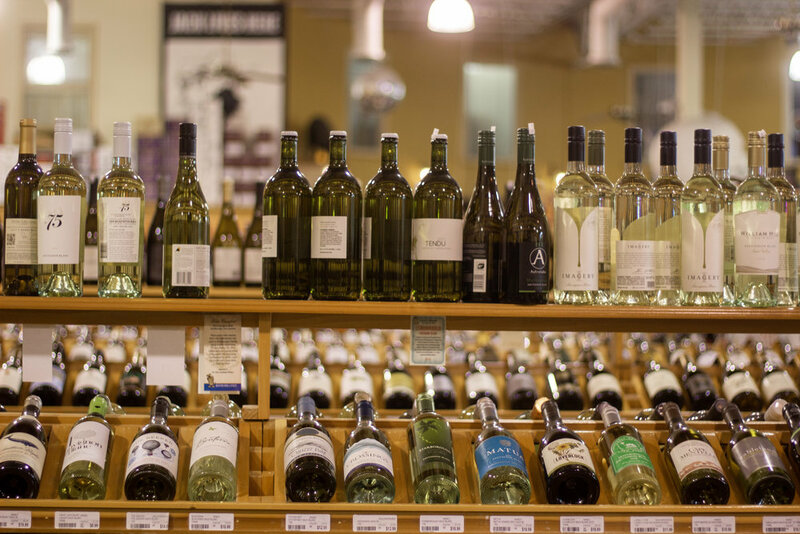 Once Laura helped me figure out a type of wine for each candy, I headed to my local liquor store, Midtown Corkdorks, and they helped me find a specific bottle of each type of wine that Laura recommended! So without further ado, here are the top five halloween candies that you guys suggested, along with some great wines to pair them with! Reese’s pumpkins were a super popular suggestion! I don’t know what it is about the pumpkin shape, but somehow it makes them taste so much better than regular Reese’s cups! For Reese’s pumpkins, Laura suggested either a Ruby Port, a LBV (Late Bottle Vintage) Port, or a Syrah from the Northern Rhone region! Ruby Port - Ruby Port tends to be fruit forward with a caramelized flavor that it gets from the barrels that it’s aged in, which would pair well with the chocolate peanut butter flavor of a Reese’s Pumpkin! It also has a bit of spiciness and a higher alcohol content (usually around 19%) which helps to even out the sweetness! LBV Port - LBV Port is typically more affordable than Ruby Port, making it the more accessible option! It is still a sweet wine with a higher alcohol content, but it will have a bit more of a chocolate quality to it! Northern Rhone Syrah - If you’re not a fan of Port wines and want a dryer option to pair with your Reese’s, then this is the one for you! Syrah is a full bodied wine and will have a fruity, raspberry flavor to it with a bit of a milk chocolate finish! For Kit Kats, Laura recommends a Russian River Valley Pinot Noir! Russian River Valley Pinot Noir’s are known for having a vanilla cola note to balance out the crunchy chocolateyness (is that a word?) of the Kit Kat. They are also very light bodied, making them a perfect pairing for milk chocolate! Growing up, these were always one of my favorites, so I was so excited to see it as a suggestion! For these, Laura recommends a Riesling from Alsace. While Rieslings are typically seen as a sweeter wine, an Alsace Riesling is on the dry side, and has a caramelized apple flavor, making it a perfect match for a caramel apple lollipop! I got a few suggestions for candy corn, and while I know that it’s a super polarizing candy that some people love to hate, I had to include it because it’s such a Halloween classic! Since candy corn has kind of a vanilla, marshmallow and caramel flavor, Laura suggested two wines that would go well with it! The first is a Marsala, and the second is a Madiera Reserve! You guys just suggested Starbursts, but since there are so many different Starburst flavors, we decided to go with pink Starbursts, because let’s be real, they’re everyone’s favorite! For a pink Starburst, Laura recommends a Rose Champagne, preferably brut or extra brut! If possible, look for a Rose Champagne that’s a blend of Pinot Noir and Chardonnay! This wine will have flavors of strawberry and watermelon, making it a great match for pink Starbursts! Cheers to the weekend! I hope you all have a fun and safe halloween, complete with plenty of candy and of course, wine! A special thank you to Laura for helping me come up with these pairings (and by that I mean for coming up with these pairings because tbh as much as I like to think I know about wine, I wasn’t much help at all! haha) and to the super helpful Midtown Corkdorks employee who took the time to show me a ton of different wine options and so kindly put up with my multiple extremely specific requests!